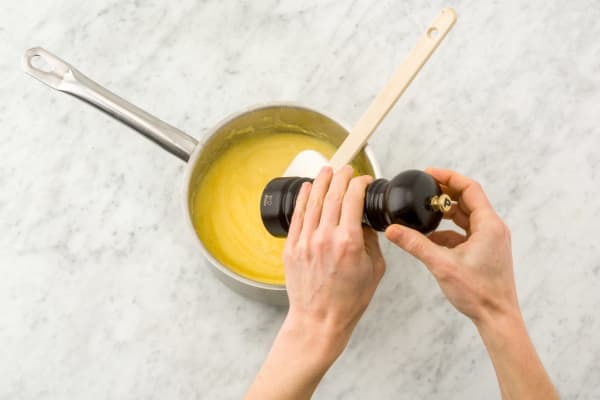 Polenta was once considered ‘food of the peasants’. It’s so popular nowadays that there has even been an Italian folk song written about it: ‘La Bella Polenta’! We recommend you put on some folk music and have a little dance around the kitchen to get you in the mood for this Italian feast! Put the dried mushrooms into a small bowl and pour over 400ml of boiling water. Leave to soak for 20 mins. Peel and finely chop the garlic and finely chop the chilli. 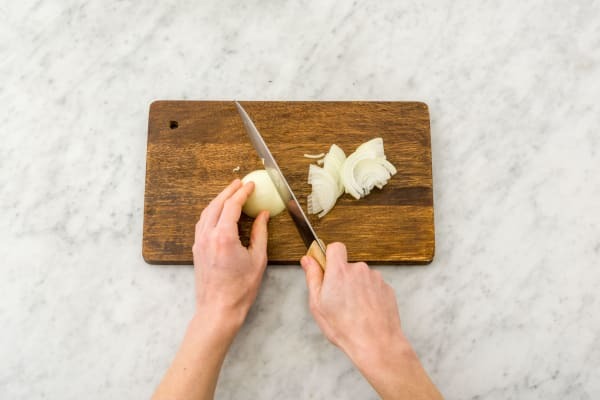 Peel and thinly slice your onions into half moon shapes. Cut the sausages into 2cm wide slices. 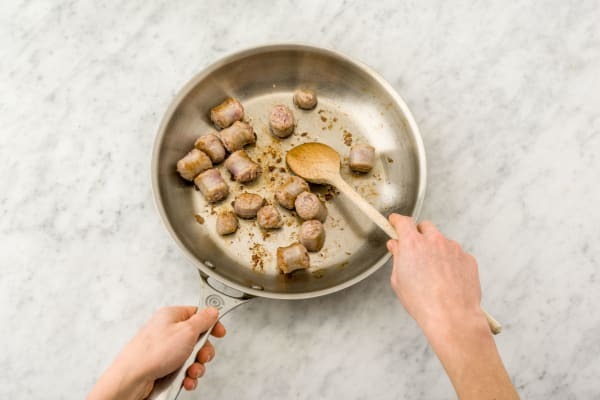 Heat 2 tbsp of olive oil in a frying pan, add the sausage and gently fry on medium heat for 6-7 mins until browned. Turn down the heat slightly and add the onions and sweat for 5 mins together with the sausages. Next add the garlic and chilli (the amount depends on how spicy you like things!) 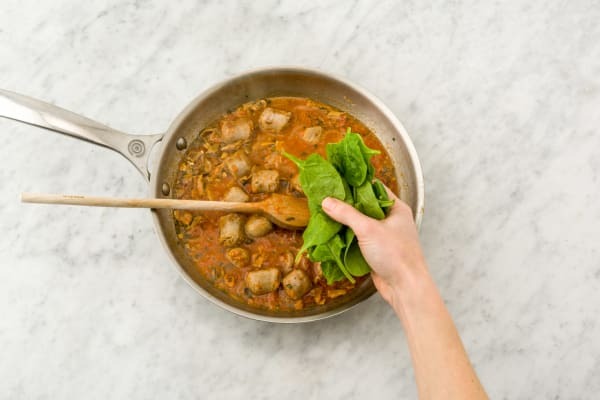 to your pan, cooking everything together for an additional 4 mins. Meanwhile, strip the rosemary leaves from their stems and roughly chop. Add them to the pan too. Drain (hold onto the soaking water!) and roughly chop the mushrooms and add them to the pan too. Pour in the reserved soaking water. Tip: This helps add a nice umami flavour! Stir in the chopped tomatoes, 500ml of boiling water, ¼ tsp of salt and ¼ tsp of pepper. Simmer uncovered for 10 mins, then add the spinach to wilt for the last 2 mins. Meanwhile, make the polenta. Bring 625ml of water to the boil in a large pot with ½ tsp of salt. Grate the parmesan and tear the gouda into small pieces. Once the water is boiling reduce the heat so the water is simmering and add the polenta to the pot, stirring continuously. After 4 mins, and with the pot still on the heat, add the butter, cheeses, a good grind of black pepper and mix well. Continue to cook. The cheesy polenta should be ready after about 10 mins in total. Taste and add more salt if necessary. 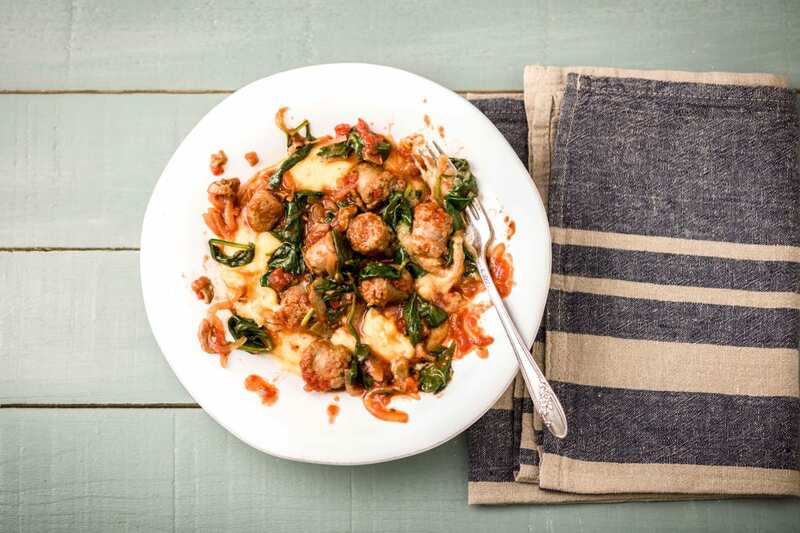 Serve the cheesy polenta, topped with the sausage stew in bowls and buon appetito!